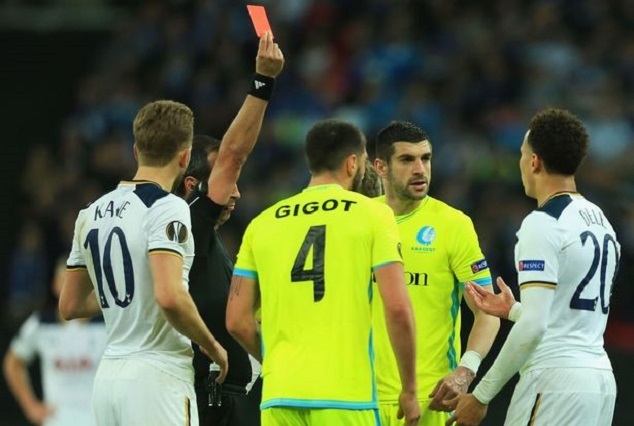 Former Tottenham Hotspurs manager Harry Redknapp has slammed the club’s star midfielder Dele Alli following his red card during his side’s 2-2 draw against Belgian side Gent in their UEFA Europa League (UEL) second leg clash at the Wembley Stadium,leading to the North London side’s exit from the competition after a 3-2 aggregate loss. Dele Alli was sent off six minutes from time after his horror challenge on Brecht Dejaegere prompting Redknapp to call out the former MK Dons midfielder adding that his tackle could have possibly ended the career of his opponent. And former Spurs boss, now TV pundit, Harry Redknapp blasted hothead Alli. Alli’s challenge was also criticised by former Tottenham midfielder and manager Glenn Hoddle.